You know already how much I love art guides (duh! ), but possibly you don’t know my love for food. So when the occasion arose to write an art guide that would embrace both, I could not resist. So today I am truly excited to present you, my beloved readers, with my first collaboration with Carla Capalbo, award-winning photographer, foodie and traveller (among other amazing things). Her deep knowledge of Georgian culture and food, lead her to put together a book — Tasting Georgia — narrating through photos and recipes the culinary history and traditions of an enchanting country. For this collaboration, Carla and I have joined forces, and we’re proud to give you today this unique Art Guide about Georgia. Enjoy! In a coun­try of 3.7 mil­lion in­hab­i­tants of which 1.1 million live in the cap­i­tal, it often seems there is a lack of space for artists. But the prob­lem is not a lack of space at all. 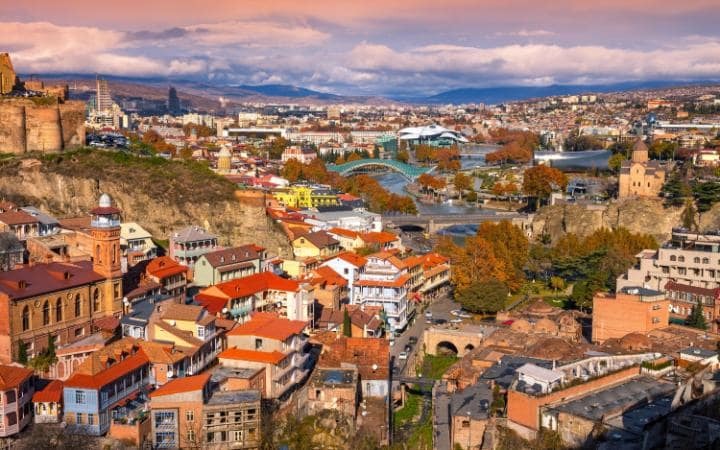 The fact that Tbilisi, the capital of Georgia, does not have a permanent contemporary art museum is one of the myriad problems facing the city’s art scene, much of which is rooted in the country’s turbulent recent history. 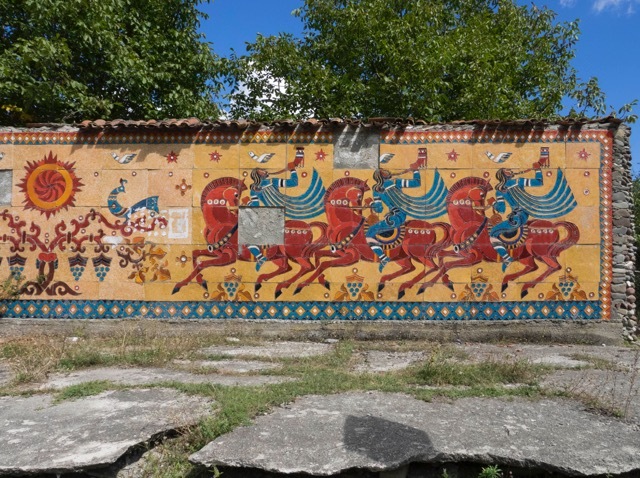 Georgia is dotted with Russian and Soviet monuments of all scales and descriptions. 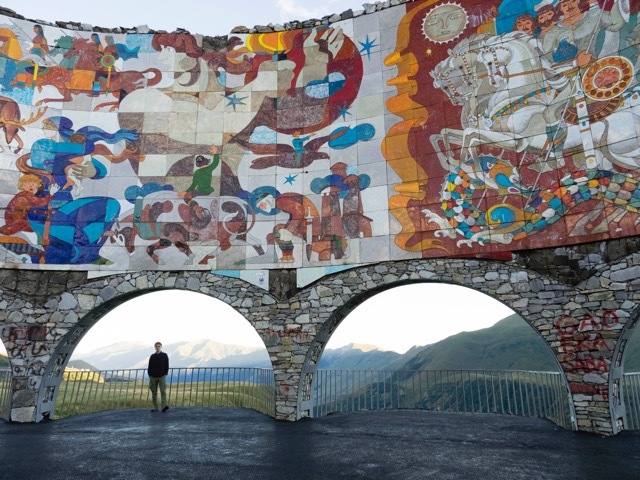 This, the Russian-Georgian Friendship Monument, is on the Georgian Military Highway, high in the mountains towards Kazbegi (and Vladikavkaz). The vast tiled structure is built in a semi-circle and frames the view of the Greater Caucasus Mountains in all directions. Here’s another Soviet artwork, this time a humble bus stop with less than all its faculties intact. It’s still operative: the last time I passed a few goats were sheltering along it from the rain. 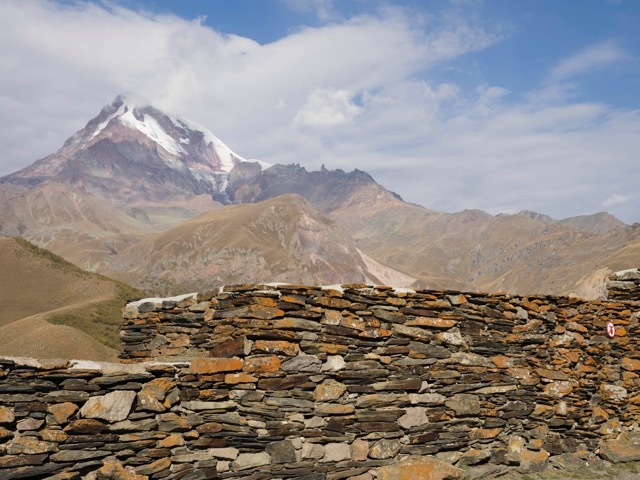 The small Gergeti Trinity Church is itself an artwork, hewn from the same rock as the Gergeti Glacier above it. Even the lichen seems colour-coordinated with its ‘painted’ backdrop. The church and monastery are at 2,170 metres, and now are home to a mere handful of monks. 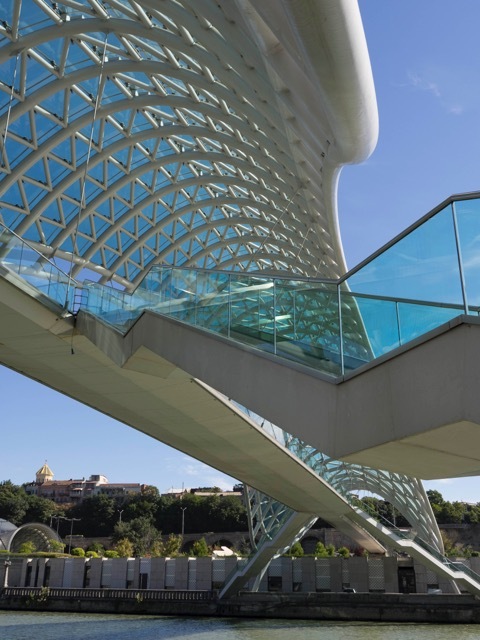 An attempt in post-Soviet Tbilisi to invigorate the city with modern architecture led to the building of Michele De Lucchi’s ‘Peace Bridge’, a steel and glass structure that straddles the Kura River in the city centre like a watery wave. 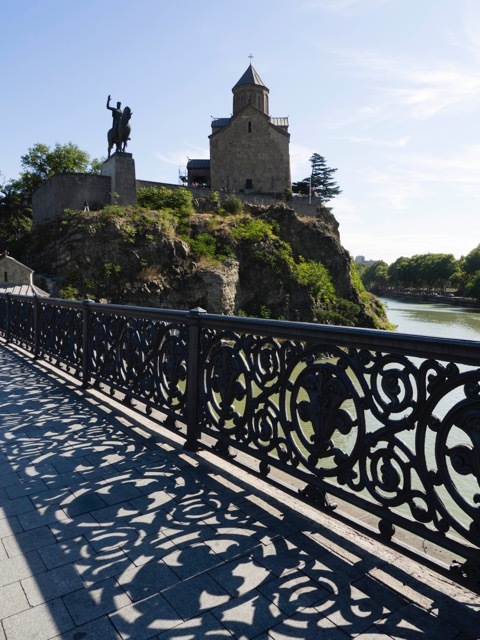 Just a few hundred metres from it, the busy Metekhi bridge is one of the main arteries in the city, connecting Tbilisi’s Right and Left Banks. Towering above it stands the equestrian statue of King Vakhtang Gorgasali who founded Tbilisi in the 5th century after discovering its hot springs when he was out hunting. Queen Tamara (also known as ‘King Tamar’) was a 12th-century Georgian queen and warrior. She ruled the country during its Golden Age, and was known for her battle strategies. 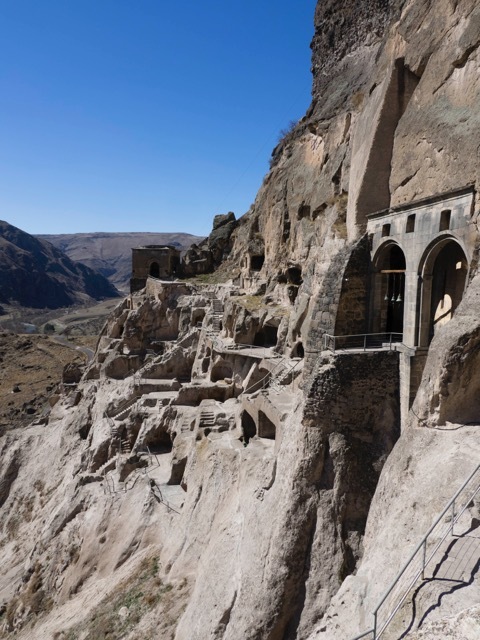 Queen Tamara housed 10,000 soldiers in the cave city of Vardzia, along with 600 horses and all the attendants the warriors needed. The 12th-century city was begun by her father and was, at that time, completely hidden from view, dug from the inside the mountain on a key pass into Georgia from the east. The soldiers would swoop down from their hiding places at night, ravage the attackers and then disappear again into the safety of the caves. At the time, each ‘room’ had running water and light from burning torches. Wine was made inside in 25 cellars, and there were 13 churches. Vardzia was destroyed by a powerful earthquake in 1283 when the mountain façade collapsed and revealed the city from outside. Today about 40 percent has been cleared and is open to the public. Vardzia is one of Georgia’s many UNESCO World Heritage Sites. 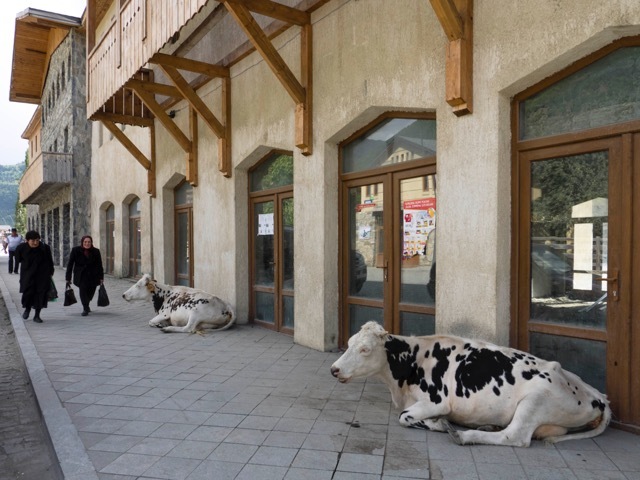 The global fad for life-size cow sculptures began here, in downtown Mestia, Svaneti. It was largely through personal initiatives that the contemporary art scene in this country has developed and has been able to survive. One of the few public museums, Tbilisi National Gallery (formerly called the Blue Gallery), which has a good collection of early 20th-century avant-garde Georgian works, has been reopened in 2011 after more than a decade of “closed for renovations”, having not purchased any new pieces since 1988. One of the newest and most successful private initiatives has been the opening, in 2010, of The Center of Contemporary Art – Tbilisi. 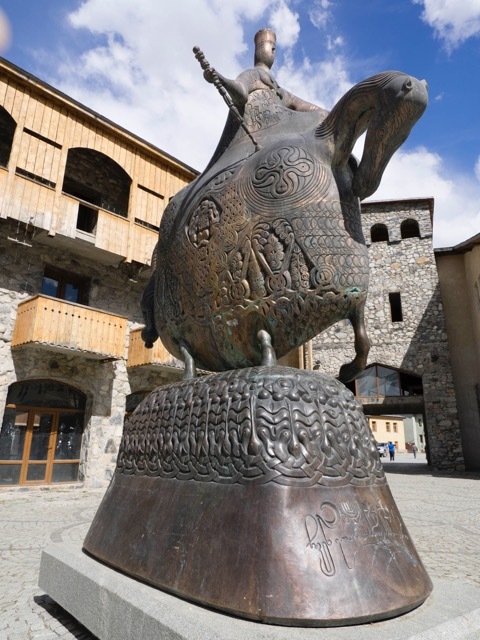 The privately run centre, which offers artist residencies as well as courses for students in disciplines including painting, photography and new media, was the brainchild of the artist Wato Tsereteli. The locale for the CCA — originally the administrative offices of a utility company that sits along the banks of the Mtkvari River in central Tbilisi — was donated by a local bank, and Mr Tsereteli raised funds among everyone from local artists to foreign government agencies like the Swiss Agency for Development and Cooperation to set up the space. 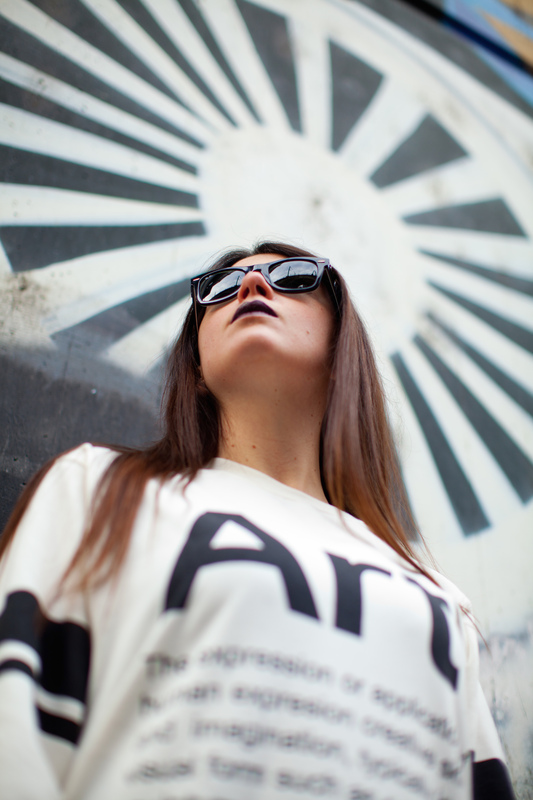 Another initiative to put Georgia on the international art scene radar has been Artisterium, launched in 2008, which has become an annual international contemporary art festival in Tbilisi. The festival lasts two-week in Autumn and has a calendar filled with contemporary art exhibitions, concerts and lectures — from both Georgian and international artists. The Georgia’s capital is perfect for a cityscape (and you can read here the 10 most interesting facts about it. You’re welcome!) and features the country’s best variety of art and exhibitions. Whether you’re drawn to photography, inspired by classic paintings or moved by contemporary works, Tbilisi has something for your aesthetic interests. The art galleries feature contemporary art, traditional fine art, glass art, paintings, prints, photography, sculpture, and other types of visual art. If you are interested in collecting art, these are some of the art galleries to visit while in Tbilisi. If you would like to discover more about the most interesting contemporary artists there, you can head to The Culture Trip and explore them now. Carla’s book, Tasting Georgia, is out now! A unique guide for those who want to visit Georgia and for those who prefer to explore a new country from their armchairs. It includes 70 authentic recipes, so it’s perfect for those wanting to master Georgian cooking. Carla visits over 40 wineries and 65 restaurants, wine bars and cooks. Her beautiful photos of Georgia’s people, food and landscapes illustrate why she’s found the country so irresistible. — All photos: © Carla Capalbo (unless otherwise specified). Posted in Art Guides and tagged art blog zurich, art blogging, art guide Tbilisi, artemporary, cityscape tbilisi, contemporary art georgia, Georgia, Tbilisi, travel visit georgia. Bookmark the permalink.